A quick summary page to appear at the top when you click on the CO11 link. Monday 7/11: Today was devoted to trying for a few more targets, mostly back in Rocky Mountain National Park. After checking out, I started towards the park. 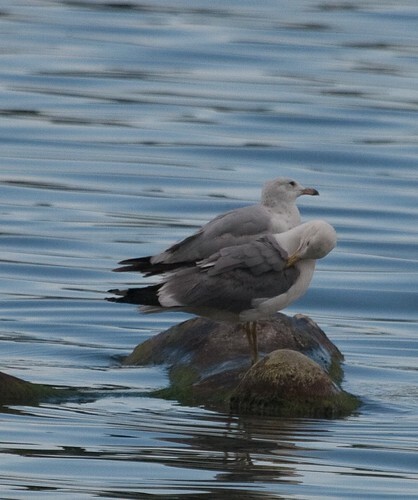 On the way, I stopped at Dixon Reservoir, which had California Gulls recently according to BirdsEye. 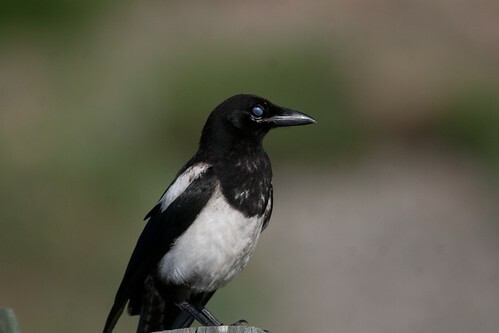 No gulls on the water, but a magpie finally cooperated for photos. Reaching RMNP, I headed back to Endovalley. 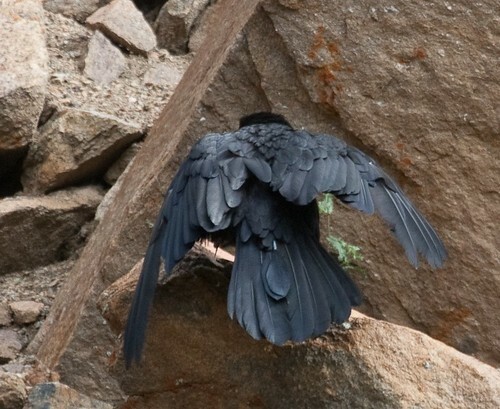 It was quieter than last time, but the Cordilleran Flycatcher was more cooperative and a Raven was up above. After looping around here, I headed to Upper Beaver Meadows. I caught up with a Dusky Flycatcher pretty quickly (too far for photos) and continued wandering around hoping for better views. 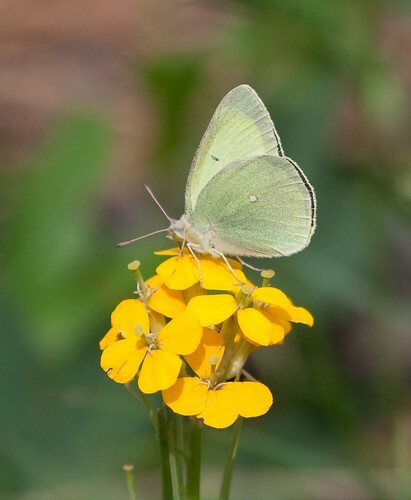 I was chasing the crossbills that were overhead and spending more time on butterflies when I heard a very soft tapping a little bit off the trail. Walking over, I found one of my main targets, an American Three-toed Woodpecker. Being careful to not disturb it, I got fairly good views but obscured photos. 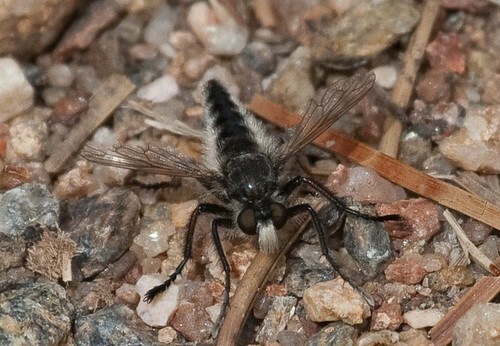 Robber Fly, possibly Cyrtopogon species. 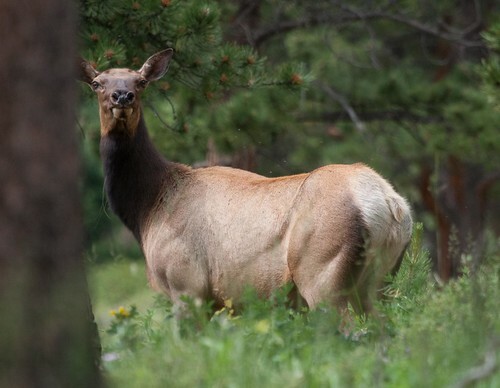 And this Elk was also along the trail. From here, I drove around the park a bit but didn’t find anything of interest. Heading out, I plugged American Dipper into BirdsEye and it suggested a little park right on the road in Estes Park. No luck with the dipper (and a likely Cassin’s Finch got away) but it was a nice little stop. I headed back towards Fort Collins and stopped at Dixon again (nothing). Checking BirdsEye again, I headed to Windsor Lake. 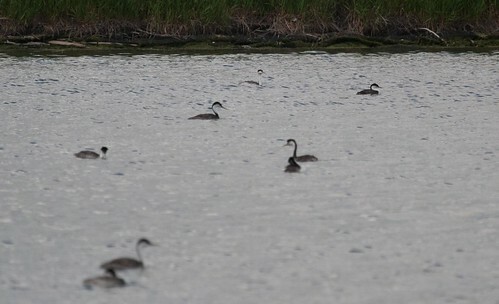 Once I reached the right section of the lake, I scoped a bit and found many Aechmophorus grebes. There were about 100 total, 90 Western and 10 Clark’s. 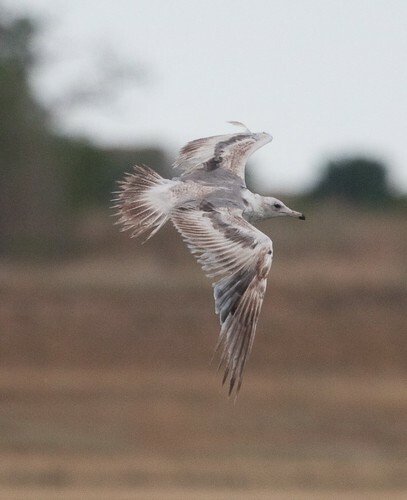 A few gulls were around, including a couple definite Californias. It was looking very threatening, so I moved on and mostly missed the rain. I headed to Denver, making a quick attempt at buying some souvenirs. The Rockies shop was closing (at 4:45…) and the other store in the area had closed for the all star break, so I failed. I decided to head partway to the airport. Traffic was pretty bad, so I eventually pulled off and grabbed the first hotel I found. Rather dumpy but ok for the last night. Wendy’s next door was good enough. I then watched the home run derby and packed. Tuesday 7/12: Headed home today. 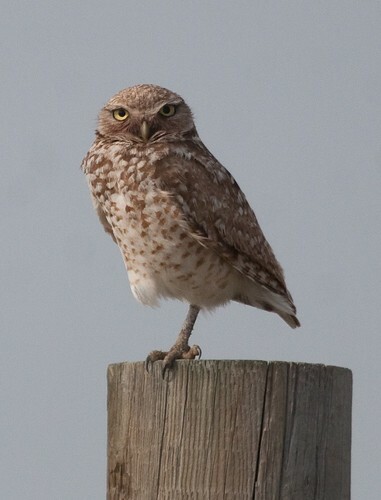 I realized I had enough time for a quick stop and the Rocky Mountain Arsenal NWR was nearby. 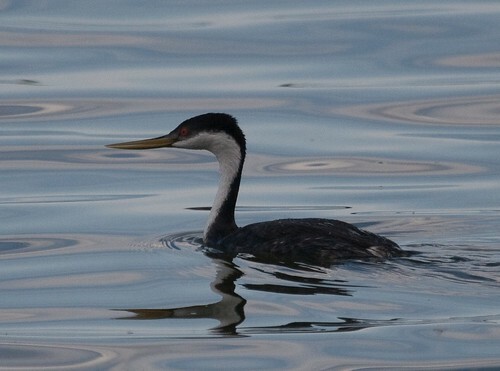 I managed to run around the closest pond and had lots of swallows plus a Black-crowned Night-Heron and a pewee. Then off to find gas and return the car. Shuttle back to the airport and then through security and a flight to Baltimore. Enough time in Baltimore to grab some food and then a short flight to Boston and back home. Sunday 7/10: Today was the second day of field trips. After a stop at Safeway for muffins, I joined the group and immediately could tell I made the right decision staying out of the mountains. 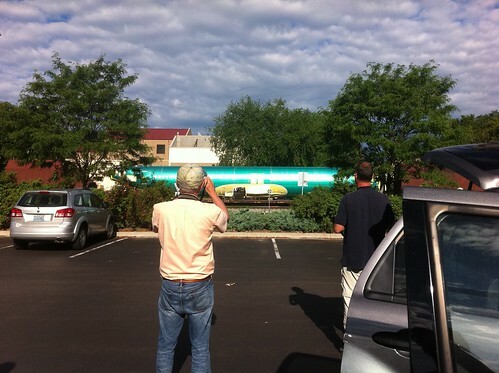 The first interesting sighting of the day came while waiting for everyone to assemble, when a train made up of airplane bodies passed by. I ended up riding with Dave and Shelley again and we headed to the first stop, the CSU Environmental Learning Center. 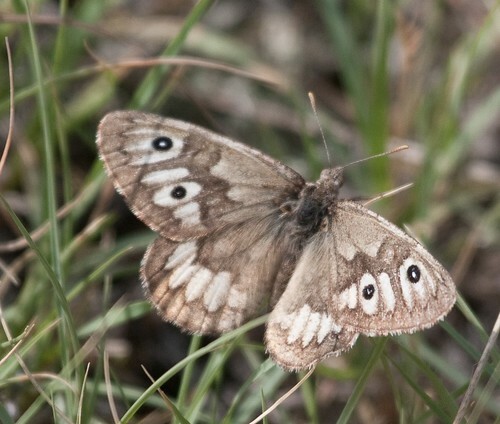 It was a bit dry and windy and it took some time to find something beyond meadowhawks. 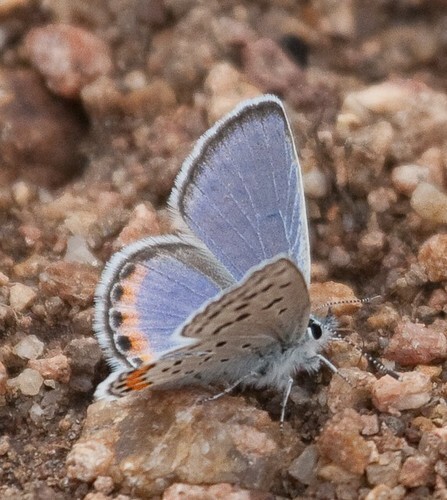 We did eventually come up with Blue-eyed Darners and a few other moderately interesting odes. 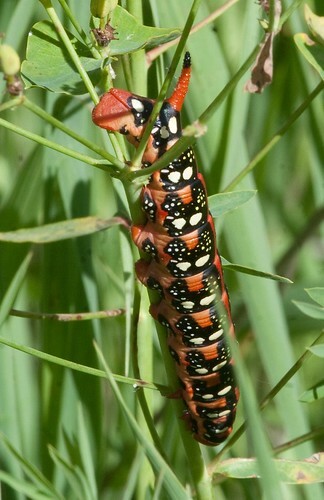 Also lots and lots of grasshoppers (several in every net swing through the grass) plus a Spurge Hawk Moth caterpillar. 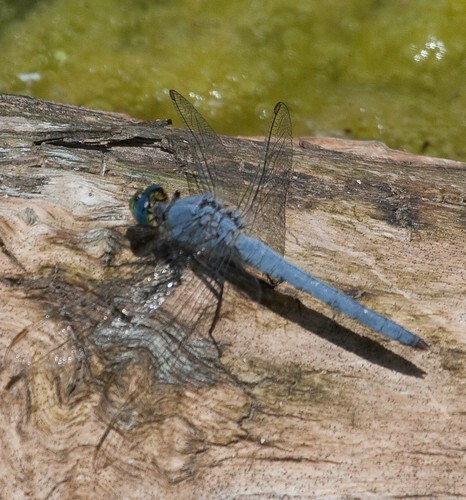 Back at the parking lot, we found a few more things including this Western-type Eastern Pondhawk. We then moved on to the Frank SWA nearby. 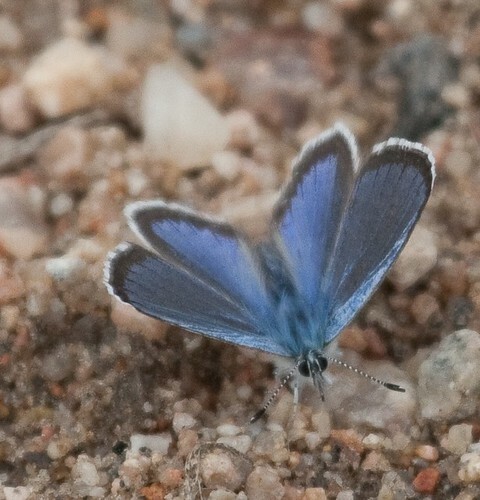 It wasn’t overly exciting but I eventually picked up at least 5 species of Bluets and some American Rubyspots. Nothing good for photographing though. After a brief snack stop, we continued to the Golden Ponds in Longmont. 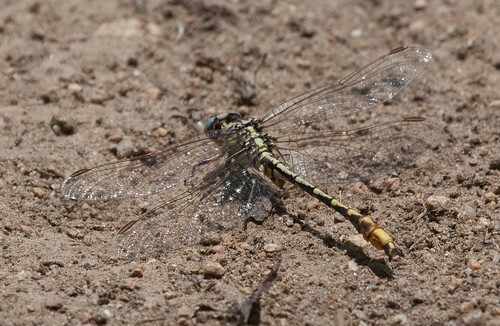 Although not much to look at, they produced lots of good things starting with Sulphur-tipped Clubtail. Working around, there were lots of other odes, most of which turned out to be eastern ones that got the locals excited and bored the rest of us. 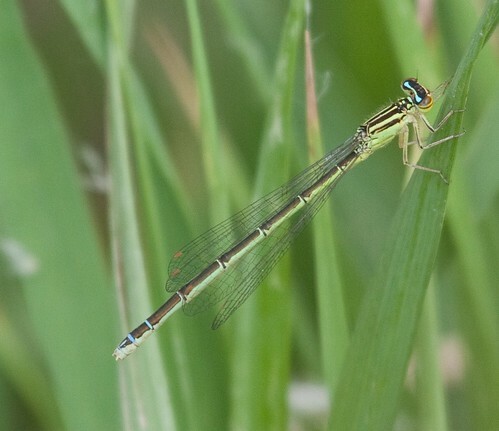 This Western Pondhawk was good for everyone (good for the easterners and interesting taxonomically for the locals as most of the females looked like the Eastern one earlier). 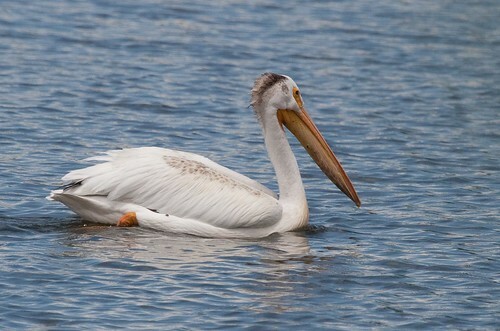 The pelican also entertained some of us. We continued all around and watched the thunderstorms just to the south. At this point, our car bailed on the day and headed off to find ice cream. The root beer float was a perfect break. Back at the car, some of the other group was returning and had an orchid as highlight of the day, very glad I stayed low. 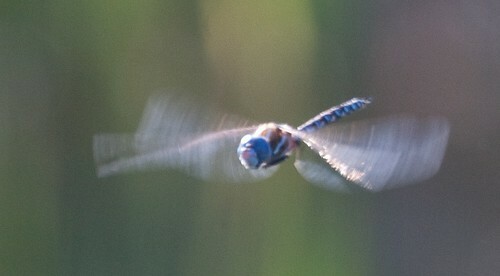 Back in Fort Collins, I decided to check a spot where others had reported many meadowhawks. It turned out to be almost adjacent to the Riverbend Ponds from Thursday. Either the meadowhawks had spread out or I wasn’t in the exact spot as I didn’t find any interesting ones, but there was plenty to keep me interested. 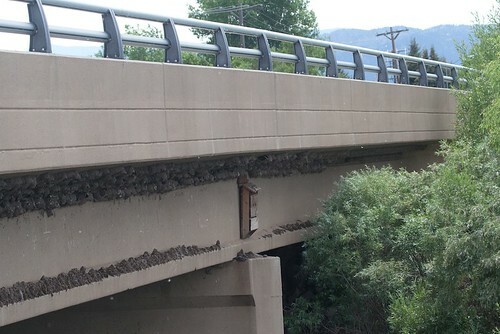 This Cliff Swallow colony was typical of most bridges in the area. 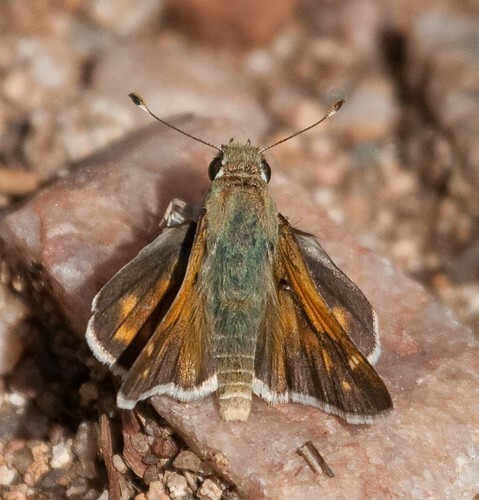 Bugs of interest included several Paiute Dancers and a couple Western Red Damsels. 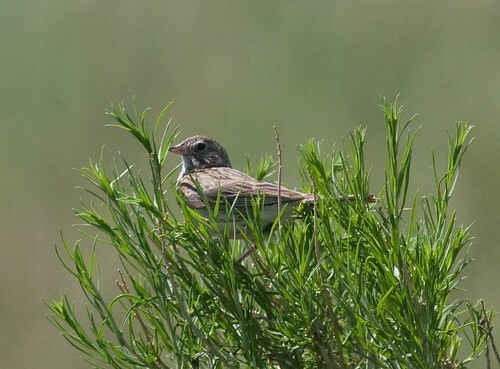 Good birds included Marsh Wrens (much harder to see than our Eastern ones) and a Blue Grosbeak. Back to the hotel for a shower and then a run back to Larkburger, where I found out that not getting fries last time was a big mistake. Saturday 7/9: Today was the indoor portion of the meeting. 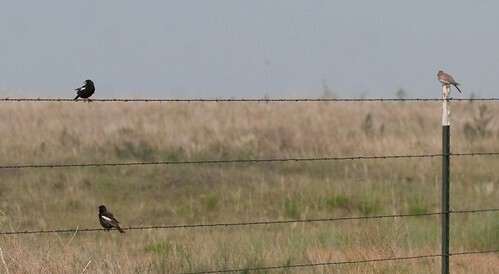 However, that didn’t start until 8:30 or so, so I decided to get up early and make the 40 minute run back to Pawnee to try again for Chestnut-collared Longspur. 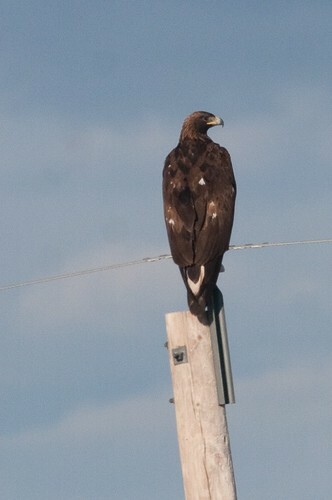 I had no luck with those again, but did get a semi-cooperative Golden Eagle on a telephone pole (for a few seconds before it flew straight off). Back to Fort Collins in time, the morning part of the meeting was very enjoyable. All the talks were excellent and other than a bit of nonsense over use of funds during the business portion, there was nothing to complain about. For lunch, Boris had arranged a meal at the student center. A few people had grumbled a bit about the lack of a cookout on the schedule, but that stopped when we saw the quality of the meal. Tons of pasta, chicken, and other things, and it was all delicious. After finishing lunch and taking the group picture, we headed back inside for more talks. I won’t complain about any, but by the last hour, they were too much. One or two less would have been ideal, especially when several were just going over survey results that were available as hand outs. For dinner, I joined Dave, Shelly, Kathy, Dave, Paul, and Steve at Tortilla Marissa’s. I had chicken flautas, which are deep fried tortillas and were excellent. Again, we were outside and had a great time. Back to the hotel to get ready for the final day’s field trips. I was still a bit undecided about whether I wanted to go up to the mountains or stay more local. The mountains had more exciting stuff, but weather was likely an issue and reports were that things were just starting their flight season. Plus the mountain trip left much earlier, so staying local won out. Friday 7/8: Today was the first day of field trips. I was one of the first arrivals at the parking lot, but it didn’t take long for a big crowd to develop. We eventually headed out and I joined Dave and Shelley. As is usual on these field trips, I didn’t spend a lot of time with the camera. Our first stop was Parvin Lake. 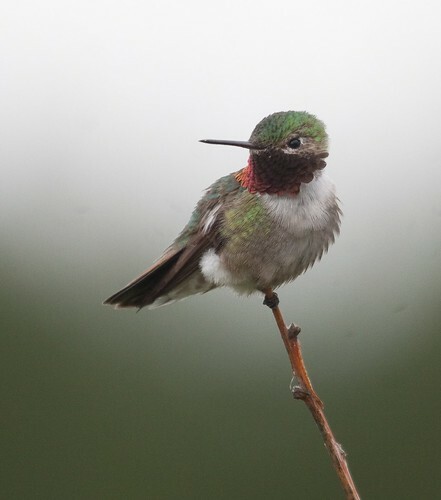 It was still pretty overcast, so after being entertained by a hummingbird by the bathrooms, it took quite a bit of effort to find any odes. 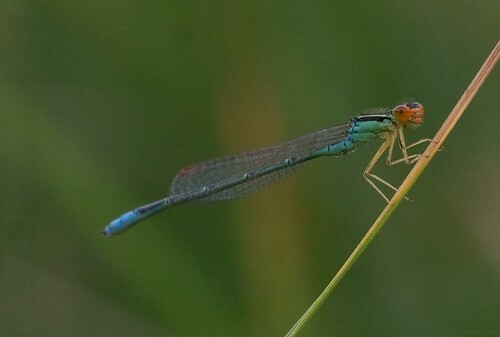 After a lot of sweeping of vegetation, I came up with a single forktail. We followed the road out to the further edge of the lake and it started to brighten up a bit and a few things were flying. But the main highlight was a cat that appeared to live at the research station which decided that Steve’s net was the perfect spot for a nap (unfortunately no picture). 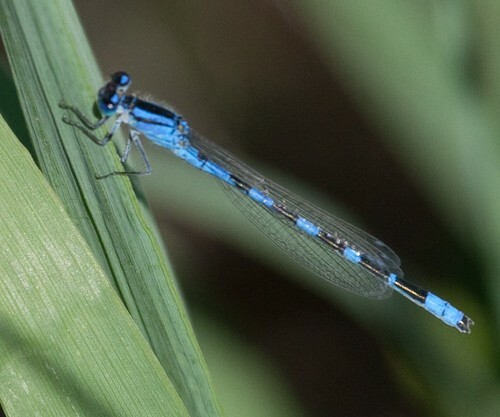 Working back, we found a few Enallagma, all apparently Boreal Bluets, along with some Coenagrion (Taiga Bluet) and a few Leucorrhinia (Whitefaces). Some of the group peeled off here and after some confusion about who remained, we moved on to another site (one of the various Lost Lakes). The sun was out here but it was rather windy. 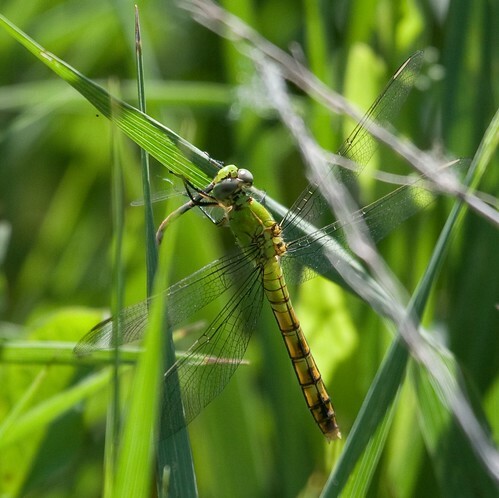 Lots of meadowhawks and Spotted Spreadwings were around but not a whole lot else. Boris (who organized the meeting and might be the most enthusiastic person I’ve met) pulled up a young Tiger Salamander. 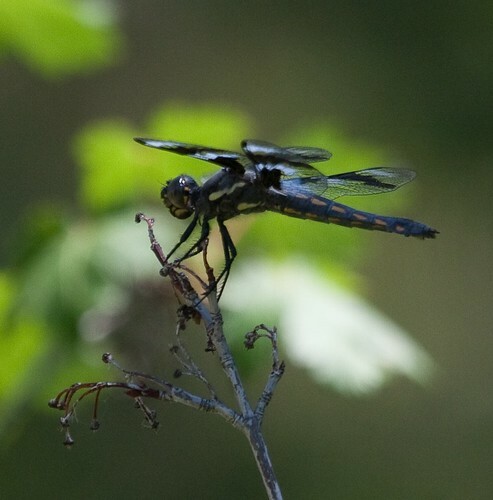 We moved on to another wetland just up the road, where there were lots of Aeshnas flying (apparently mostly to all Variable Darner) and hundreds of whitefaces. Clouds were rolling in, so we ended the trip and headed back to Fort Collins. Back in Fort Collins, I moved to my new hotel (apparently I can’t calculate how many days properly). It was the Residence Inn by Marriott and I had a gigantic suite with a full kitchen (for several dollars less than the main conference hotel). After getting settled in here, I headed back to see about dinner. I didn’t see anyone around and wasn’t able to reach Dave by phone, so I just walked down the main street and ended up at a noodle place. The Thai chicken was a bit spicier than I expected but was fairly good. On the way back I ran into Shelley, who commented that the main group had gone to a place that was unbelievably noisy, so I didn’t feel too bad about missing out. Back to the hotel for an early night as I had plans before the indoor meeting. Thursday 7/7: The DSA meeting semi-started this afternoon, so I spent the morning poking around locally before meeting up with people. I used BirdsEye to look for close locations for a few of my remaining targets and picked Bobcat Ridge Natural Area. It was only a short distance from Fort Collins and proved to be a very nice place. 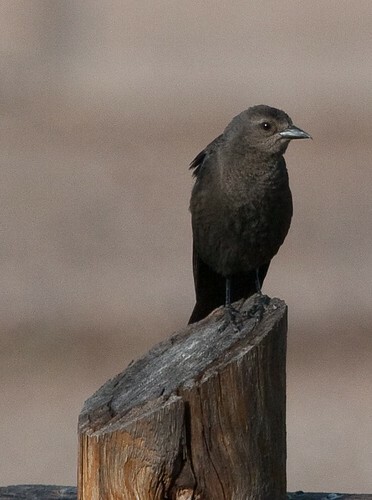 The parking lot was loaded with Brewer’s Blackbirds, finally giving me a good chance to study them. 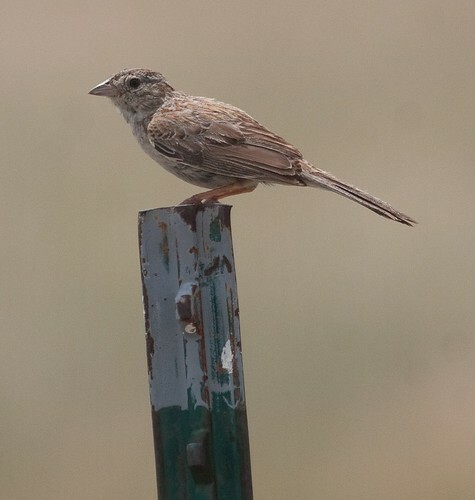 Still not seeing much similarity to Rusty, way more gracklish. 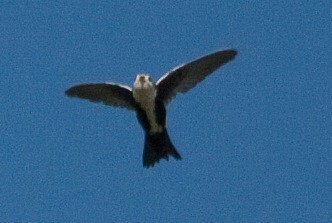 Walking up the hill, I found a nice flicker and then a variety of sparrows including several Lark. 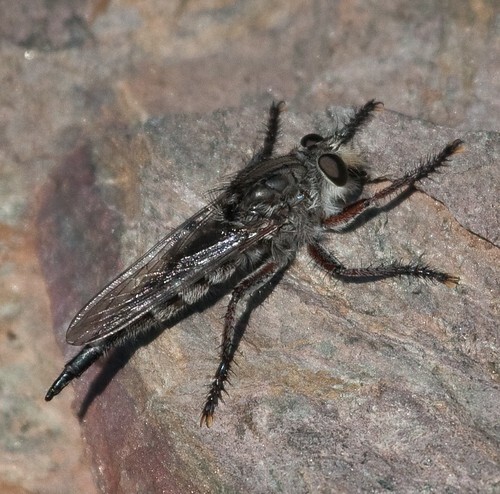 There were also a bunch of impressive robber flies and more fritillaries. 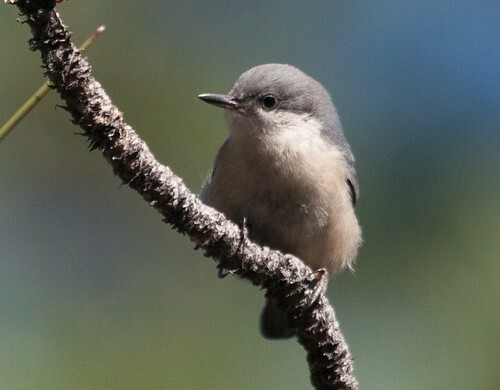 Up in the pines about halfway around, I found my target: a family of Pygmy Nuthatches. 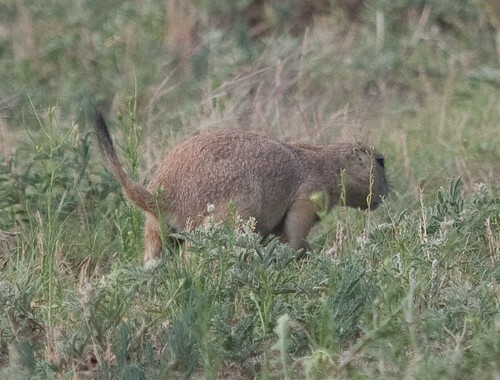 After watching them for several minutes (and trying to turn the pewees in the area into target Empids), I moved on, back into the grassier areas. 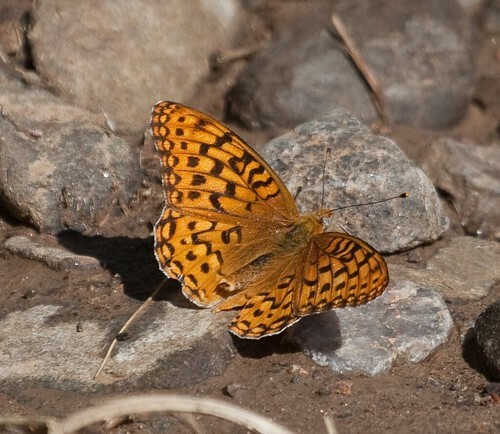 Birds thinned out a bit but there was a Bobolink and some Vesper Sparrows and fritillaries were all over, along with a few skippers. 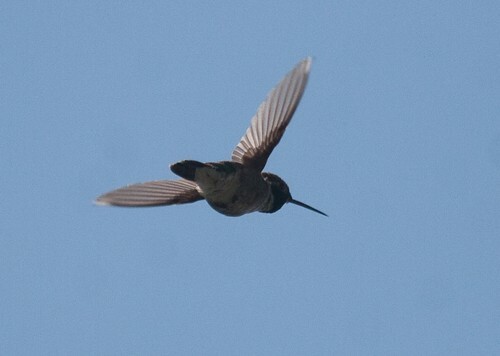 Most of the way back, I found a hummingbird doing some form of display. It flew up and hovered in place for a good 30 seconds. Back at the car, I realized that the Eurasian Collared-Dove I was hearing was not way off. 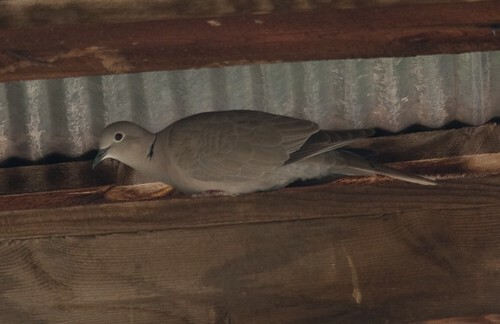 I poked my head into the stable-like building and found a nesting pair. From here, I headed back to the hotel, stopping at the Safeway to buy sandwiches for a couple days (read the ingredients carefully to avoid mayo but missed the pickles which were overly strong). 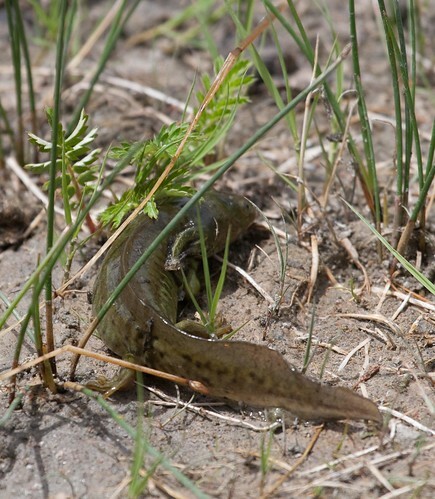 After a shower, I decided to head to the nearest ponds and hope to run into some of the convention crew. The Riverbend Ponds were the closest location. It was a bit cloudy and drizzly when I arrived but I started to walk around anyway. 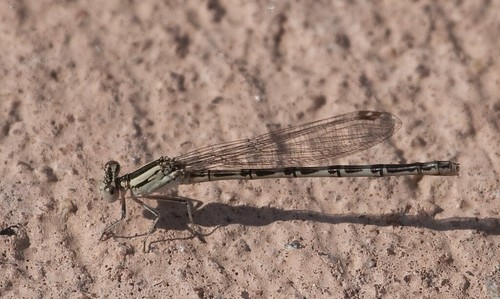 A single baskettail was working the edge but did not cooperate. Further on, I found a pile of bluets, including several Double-striped, along with Blue-fronted Dancers. Circling around, I reached the parking lot and found the Pacific northwest contingent of Jim, Cary, and Steve. 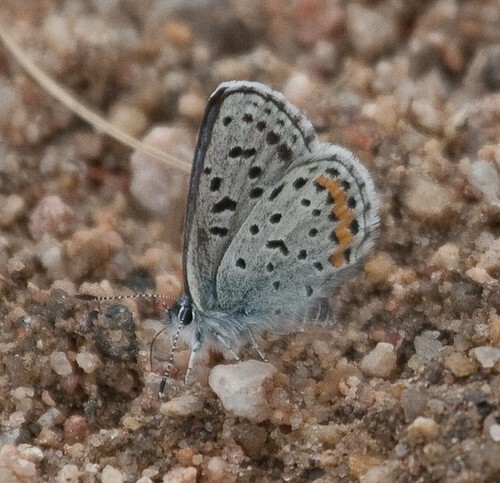 After quick reintroductions, we started around again (Cary had picked up a Rainbow Bluet and was promptly yelled at by a passing ranger). 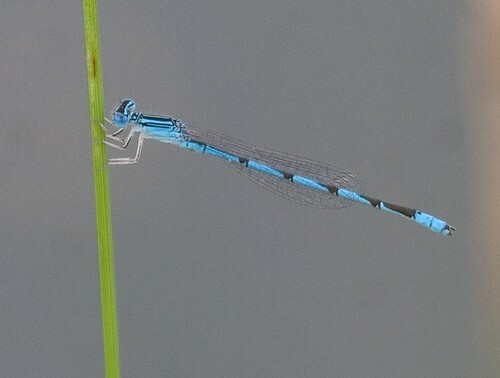 Bluets were all over, including many Rainbows and there were a few Widow Skimmers and other dragons around. After finishing here, I headed to the CSU campus to check out the meeting spot for tomorrow’s field trip. I then headed to the main conference hotel and met up with a larger crowd. Most of us walked to a nearby place for dinner, Avogadro’s Number. My falafel was pretty good, but the service was very slow. We sat outside and had an enjoyable time, even if it was a little cool and threatening. Back to the hotel and then bed for an early morning. After running from an approaching storm, I headed to Fort Collins. I found the La Quinta right off the highway and ended up at Larkburger for dinner, where the only complaint was that I got a salad instead of fries. Tuesday 7/5: I headed to Rocky Mountain National Park today. After a bit of getting lost in Estes Park, I reached the park, paid, and started in. I decided to stop at the first trail to get a feel for the place (plus it was a good hour and a half to the park and I was ready to stretch), so I got out at Lawn Lake and started to walk. 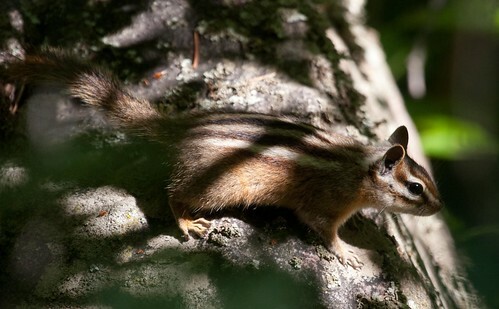 Almost immediately I found a Golden-mantled Ground Squirrel. I pulled out the camera and found that it wouldn’t turn on. Fortunately, it turned out that I didn’t disconnect it properly downloading pictures last night and the battery was drained. But I was limited to phone cam only for the day. After dumping the camera, I walked a bit of the trail and was rewarded with a couple Green-tailed Towhees, target #1 on the day. Otherwise it was pretty quiet, mostly Yellow-rumps but a couple Mountain Bluebirds were nice. After looping back to the parking lot, I continued on to the Endovalley picnic area. I spent an hour wandering around here. 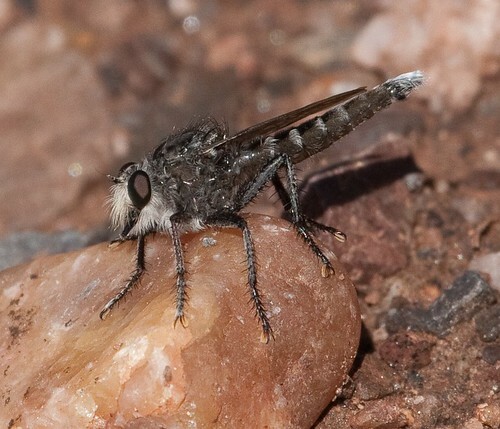 Pretty quickly, I heard a Cordilleran Flycatcher. It took a bit of effort but I did get a decent view. Back in the middle of the area, I caught some movement up in one of the pines which turned out to be a Red-naped Sapsucker. Also present were lots of Mule Deer and Mountain Chickadees among more common things. From here, I headed to the Trail Ridge Road and took my time checking the various views. Birding was a bit slow as most stops were crowded and the road isn’t one to scan from as you drive. Snow levels were way up still (a couple points still had banks well above the car). One overlook didn’t seem that bad until I noticed one of the signs was barely poking out from the snow. I did walk out a bit at one point but got winded pretty quickly and didn’t see much reason to continue. 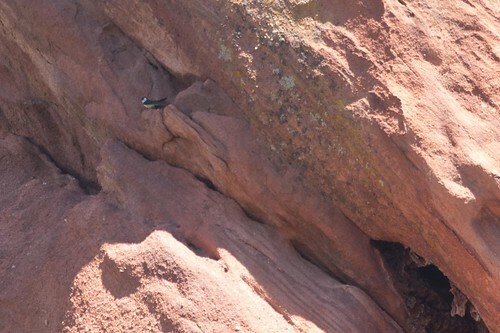 I eventually reached the Lava Cliffs, which the book said was a good spot to scan for Brown-capped Rosy-Finch. 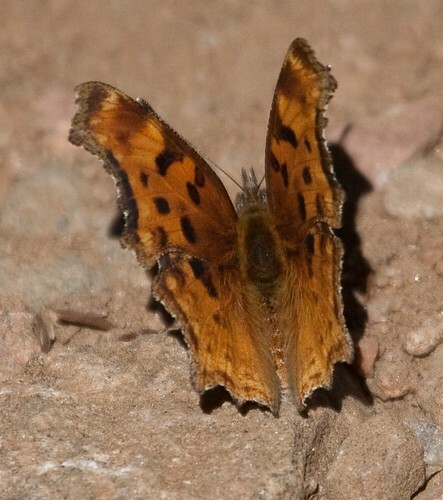 I took a look around and noticed a small brownish dot moving. 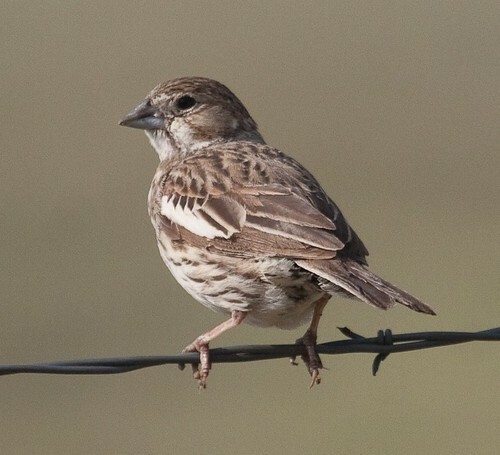 I assumed it was a finch, but when I got the scope out I discovered that my sense of distance was off and it was much bigger. 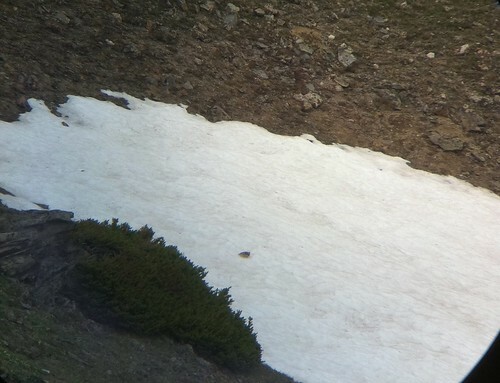 That’s phone-scoped and still hard to tell, but it’s a White-tailed Ptarmigan! 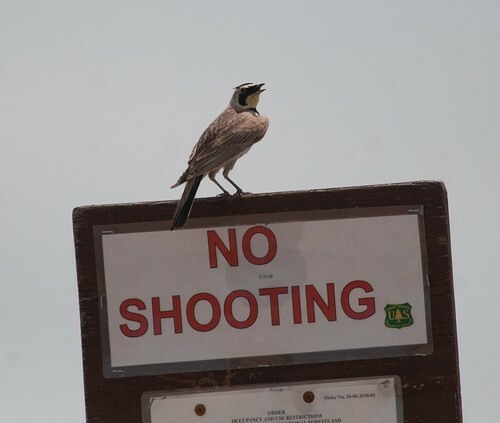 There’s no way that bird should have been that easy. I spent a few minutes watching it walk across the snow and then moved on. It was clouding up a bit, which made me very glad I wouldn’t have to start hiking for one soon. I skipped the visitor center and ended up stopping at Lake Irene. Snow was way up here and the trail turned out to be pretty rough, so I turned around (after picking up a nutcracker and Gray Jay). Moving on, it began drizzling a bit. I reached the Timber Lake parking lot and decided to pull in and have lunch and hope the weather got better. It did, so I took a walk. First up were a few Elk crossing the path. 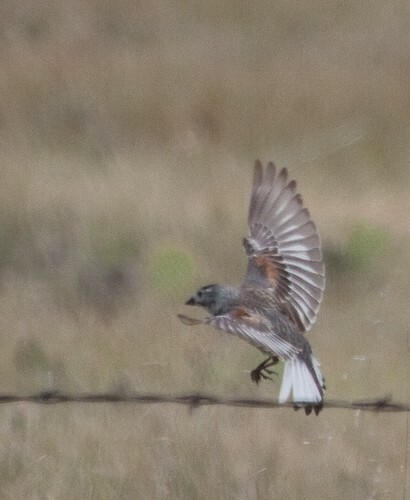 I chased a few things around, which turned out to mostly be Yellow-rumps but there was a Gray-headed Junco mixed in. At one point I heard some quiet tapping up a slope. 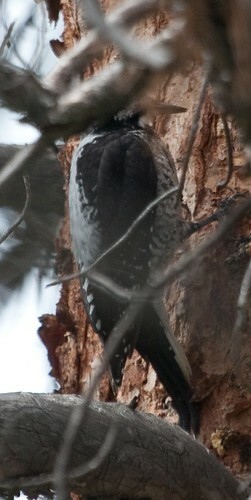 I worked my way up but was unable to find the source (which was likely a Three-toed Woodpecker). 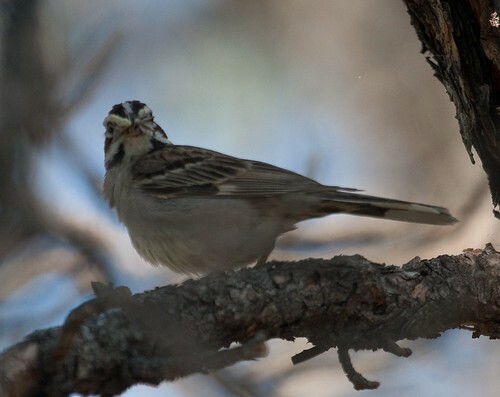 Returning to the car, I found the only White-crowned Sparrow of the trip. From here, I headed out of the park. I looked for a couple stops on the return trip, but none appealed so I headed back to the hotel. I headed towards a Venezuelan restaurant for dinner. Once I got there, I found it to be full. I didn’t feel like waiting, so I headed elsewhere. After a bit of driving around, I found Jason’s Deli and had an acceptable chicken wrap. Back to the hotel for an early night. Monday July 4: Today started well and then ended with a bit of a disaster. After clearing out of the hotel, I headed for Deer Creek Canyon Park. It was fairly similar to Roxborough (and all the foothill parks) but had a bit more birdlife. 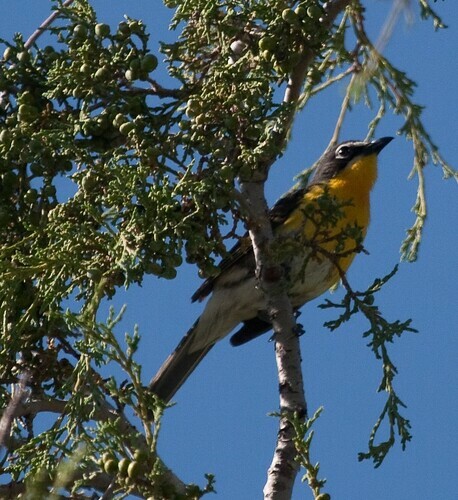 Early highlights included Yellow-breasted Chat and White-throated Swift. 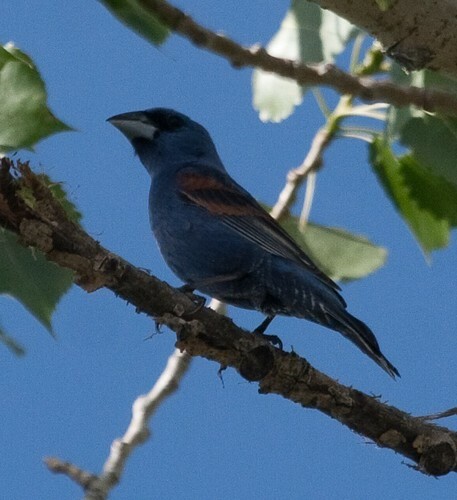 Further around, I found the only Virginia’s Warbler of the trip and had a more cooperative Lazuli Bunting. 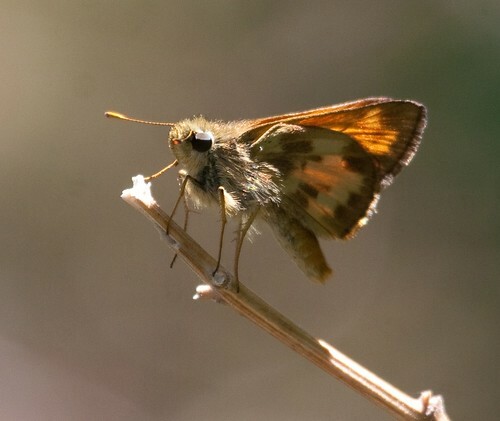 Working back to the car, I had a nice look at an as-yet unidentified chipmunk and a few butterflies including a comma and a Garita Skipperling. 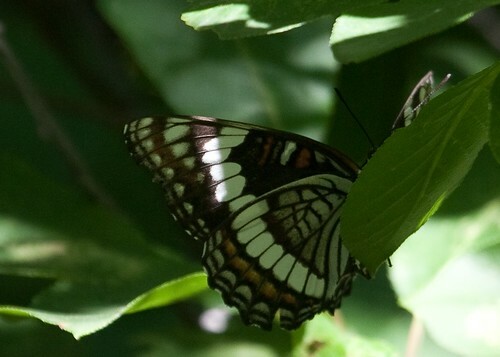 Along the wetter area, I heard an interesting song. 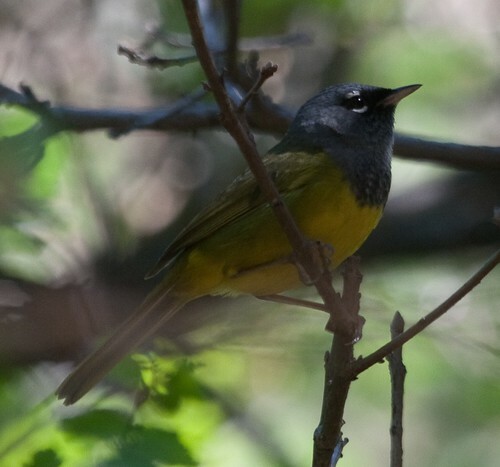 It sounded quite a bit like a Mourning Warbler and sure enough there was a MacGillivray’s posing. Back at the car, I decided to try the nearby Lair O’ the Bear Park which is a recommended site for American Dipper. Unfortunately it was mobbed (I had to park on the road in) and there were people all along the water. Walking up and around I did find a little privacy but not much beyond an Eight-spotted Skimmer. Eventually I gave up and decided that I might as well try to reach Guanella Pass and look for ptarmigan and rosy-finches. On the way, I found the car doesn’t have much power (struggled to keep it above 50 on the hills). Reaching Georgetown, I found most of the roads closed for Fourth of July celebrations and I couldn’t find my way through to the road to the pass. If I had researched the trip properly, I could have stopped for Rufous-collared Sparrow but instead I found the sheep viewing area and ate lunch. No sheep were around but a Golden-mantled Ground-Squirrel was nice. I decided to head back towards Denver or Boulder and find something easy to do for the afternoon. On the way, there were signs warning that there was an accident up ahead and the road was severely backed up. I figured it wouldn’t be that bad and it wasn’t until I got within a couple miles of the spot where the truck had overturned. Two hours later, traffic started moving again. Having had enough (it was well into the 90’s), I pulled off at the next exit and stopped at the first hotel (a Hampton Inn that was a bit overpriced). After a shower, I walked to the pizza place in the same complex. It was pretty good and there was enough left for the next two lunches. Saturday 7/2: Late morning flight from Boston to Chicago and then on to Denver. Grabbed bags, took shuttle to rental car, got out to car lot and find that the only mid-size SUV they had available had a flat tire. So either I could take a Dodge Journey or take a sedan and exchange it the next day. I took the Journey, which proved to be tolerable. On the road, it was about 40 minutes to the hotel in Centennial. Since it was late and I’d had enough driving, I walked to the Burger King down the street. Found a Desert Cottontail on the way and then had a Swainson’s Hawk being mobbed by Western Kingbirds on the way back, not quite like home. 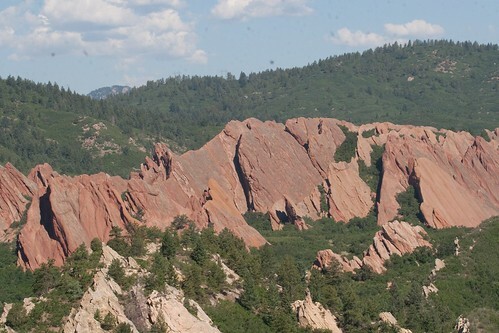 Sunday 7/3: I started the first true day of the trip by heading in the direction of Roxborough State Park. Lifer #1 was on the road almost next to the hotel, a Black-billed Magpie. Reaching the park at about 6:55, the gates were closed. I decided to try somewhere else instead of waiting (although I think the person opening up drove up before I had even turned around) and went to the nearby Aububon Trails at Chatfield State Park. Getting out of the car, I found the first of many, many Spotted Towhees of the trip (yet I’m not sure if I actually took any photos). I wandered towards the ponds, picking up some common stuff, mostly Yellow Warblers and House Wrens. 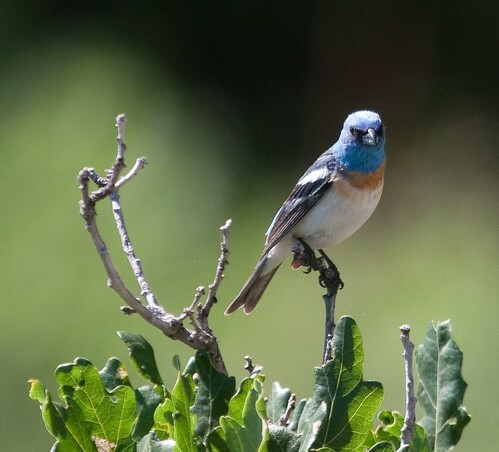 Working my way around, I heard a bunting-type song and looked up to see the chin of a Lazuli Bunting, lifer #2. 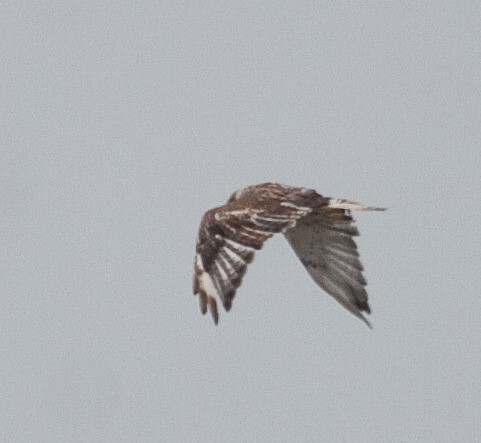 Further down, I found some Blue-eyed Darners and a Wandering Glider in flight (glider apparently would have been a county record had I taken a picture, not used to these undersurveyed areas). 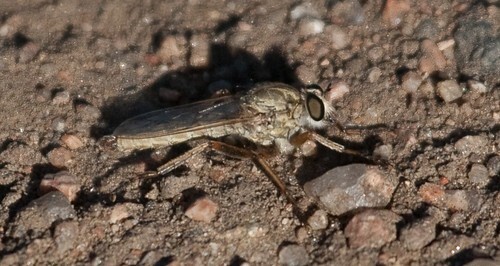 I then crossed the field (finding a cool robber fly) and wandered down the bike path a bit. 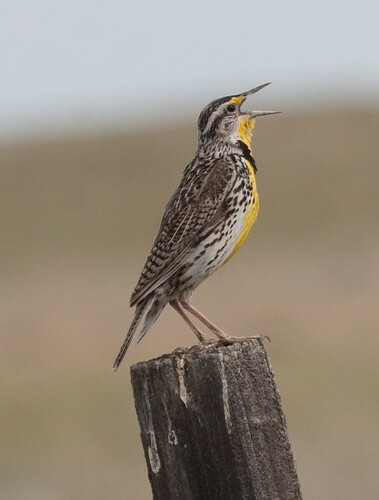 A Western Meadowlark was singing but not posing. At the far corner of the field, I started back. 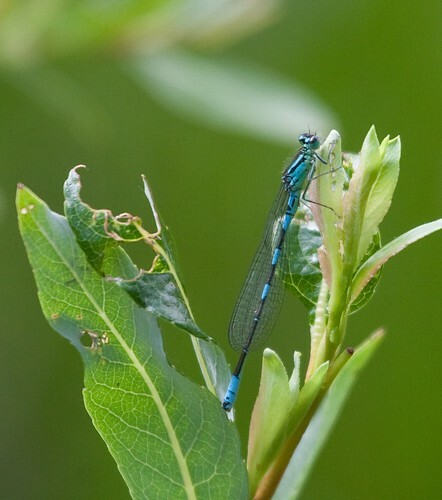 Following some of the other paths along the pond, I found a few damselflies, which appear to be Plains Forktails and Tule Bluets. Back at the car, I decided to head back to Roxborough. Getting in this time, I took the first trail I found. 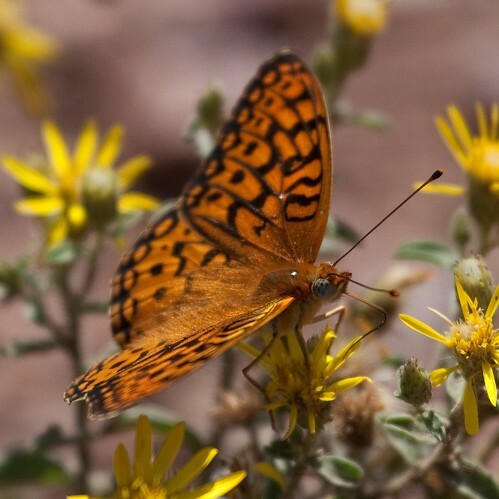 This may not have been a great choice, it was a long, hot hike up the hill and 90% of what I saw was Spotted Towhees and Blue-gray Gnatcatchers. 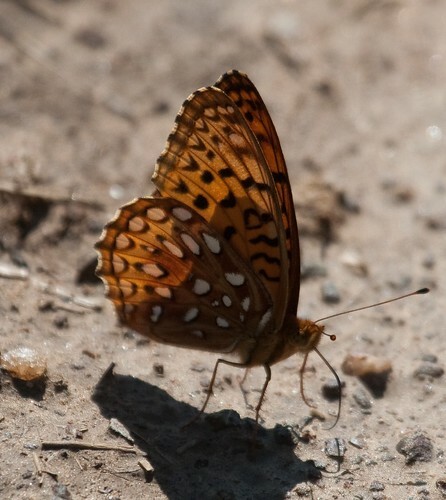 I did see a distant Prairie Falcon and a bunch of fritillaries. 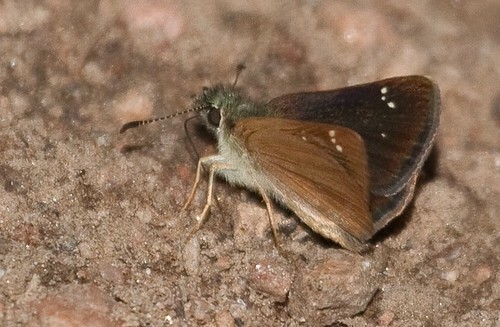 Working down, I found a few other butterflies including Taxiles Skipper. 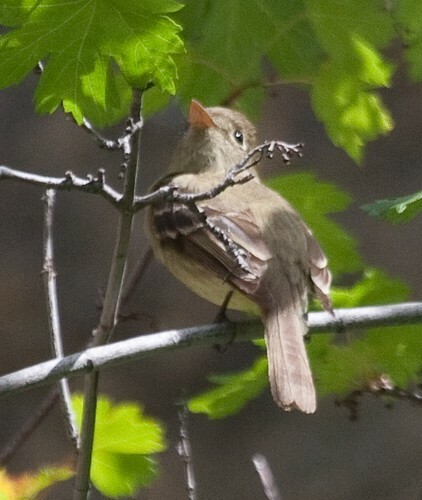 Along the wet section, I heard a Warbling Vireo and eventually got a look. 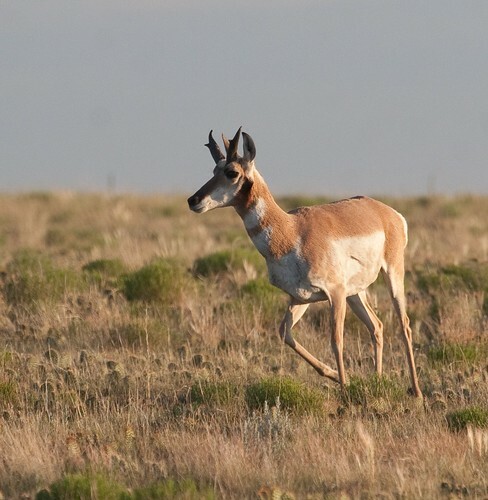 One for the bank as the western subspecies is a very likely split in the future. 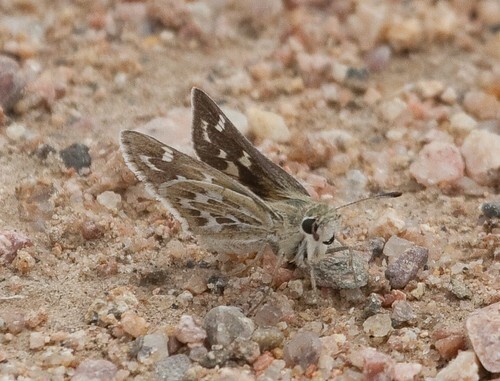 They looked pretty similar, possibly a bit smaller, but the song was faster and distinctive. 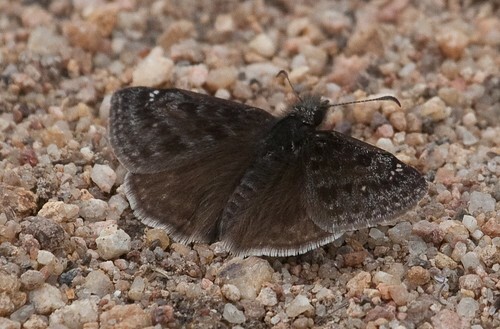 Almost all the way back, I had some White-throated Swifts go over and a Weidemeyer’s Admiral land. Eventually I also found a perched Violet-green Swallow. 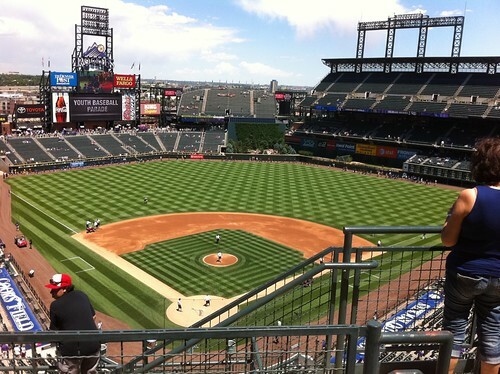 Finally reaching the car, I headed to downtown Denver and Coors Field. After a bit of looking around, I found a $15 parking lot and walked the couple blocks to the stadium. I walked right up to the ticket window. Looking at the prices, I said I’d go with the $25 tickets. The agent poked around and offered me third deck directly behind home plate for $12. Even better. I went in and went straight up to the seat. Directly behind the plate wasn’t even accurate enough, I was in line to see the corners properly. I sat and admired the view for a few minutes and then went off to find food. I eventually settled on the Hebrew National stand, where the hot dog and drink cost as much as the ticket. I wandered to the edge of the stadium which had a spectacular view of the rockies. Returning to the seat, I realized that the row behind me was in the shade and empty so I moved back and ended up staying there for the game. The game itself was rather ugly and I was quite glad I didn’t have to root for either team. It was entertaining. There are video highlights available here, Hosmer’s homer and the Gonzalez catch and injury are recommended (although the injury is pretty rough). One great moment was when someone sat down next to me during Melky Cabrera’s second at bat. He asked how the run had scored and I said Cabrera homer, paused about 2 seconds and then finished with “exactly like that but 10 feet over”. After the game, I went back to the hotel. I ended up going to a supermarket and bought roast beef for dinner (and lunches) along with water and some other supplies before turning in for the night.